Our Expert on Perdido Key and West Pensacola. Nancy has 28 years of experience as a full-time real estate agent, over time has developed excellent negotiating skills. She listens to her buyers' wants and needs to discover the type of property that fits their criteria. Her technique has led to hundreds of ;successful closings and happy customers. Nancy began working as a Realtor in Pensacola in 1996 primarily listing and selling homes and condos. She is highly experienced and knowledgeable about most Pensacola area communities including Perdido Key, Pensacola Beach, West Pensacola, Scenic Hwy, Warrington, East Hill, Downtown Pensacola and Gulf Breeze. She was the wife of a man in the military, they frequently traveled and loved every minute. Relocating is always a challenge, and she can relate other military families through her personal experience. Once final PCS orders are received, there are always questions that need require answers, and she is there to assist. She has three children that live in the Pensacola area; the youngest was born in Guam. She has four grandchildren and recently became a great-grandmother. Nancy has always said that she is too young to be a great-grandmother because she still feels and think like a thirty your old. Her favorite things to do, when not working, are photography, traveling and spending time with friends and family. Pensacola is the perfect place to live since the beaches are the most gorgeous in the world, with weather is nearly perfect, and there are always things to do. 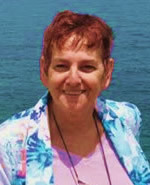 She loves the concerts in the park, the beach, walking trails, watching the dolphins play, kid parks (for the grandkids), restaurants, fishing, boating and much more.